Power electronics motor control have evolved from simple ON/OFF control to more complex electronic control circuitry in recent years. In the area of consumer electronics, the products that have been impacted by inverter based technology are air conditioners and washing machines and refrigerator. The inverter technology development has been moving at a fast pace in the quest for more efficient and environmental friendly products. Energy savings have been the key drivers as our the oil and gas resources of our earth is fast depleting. The inverter development started from AC inverter control which evolved to DC inverter control and recently sensorless brushless DC motor control. The sensorless BLDC motor inverter control has more complex circuitry but is far more efficient and long lasting compared to AC inverter control. In BLDC control, a few Hall sensors are placed on the stator of the motor to detect the position of the rotor during the operation of the motor. The sensors are normally build into the printed circuit board and mounted onto the enclosure cap of the non driving end of the motor. The setback of this method is that the sensors and PCB need to be placed in a location where the temperature of the motor will not build up and thus affect the lifetime and operation of the PCB. In Sensorless BLDC control, there is no need to have any Hall sensors to sense the position of the rotor. The sensing of the rotor position is by the analysis of the back electromotive force that is generated at the stator of the motor windings. By using this method, the reliability of the control system is enhanced. 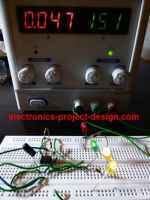 The setback of this method is that the algorithm and control circuit to detect the back EMF is complex, hence requiring more powerful microcontroller and software knowledge. A good sensorless application notes and its source codes can be downloaded from Microchip. The control circuitry functions include the sensing of Back EMF, the driving of DC Motor using IGBTs, detection of overcurrent and RS 232 communications interface. This is a good practical reference design for those who wants to learn the latest technology on sensorless brushless DC Motor Control Design.